We examine four key conceptual tensions that are at the heart of many financial reporting dilemmas: stocks versus flows, ex ante versus ex post, conventions versus economic substance, and top-down design versus bottom-up evolution as sources of accounting practice. Associated with each of these conceptual dimensions is an accounting duality; in some cases, one side (e.g., stocks) is easier to measure in a reliable manner, while the other side (e.g., flows) is easier to measure in other instances. 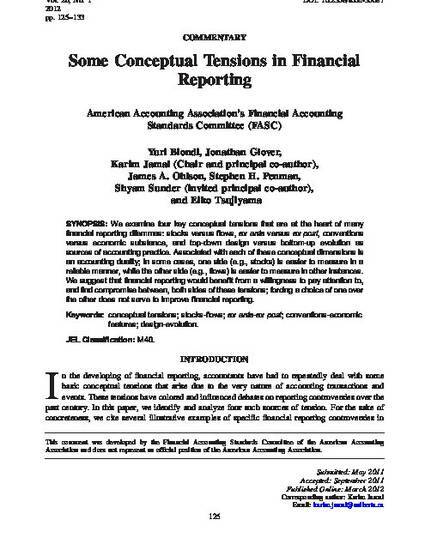 We suggest that financial reporting would benefit from a willingness to pay attention to, and find compromise between, both sides of these tensions; forcing a choice of one over the other does not serve to improve financial reporting.